Lots of room options. Big on hospitality. One great Door Peninsula location. Rooms, Suites & Cottages! That’s what we experienced on our tour of the A Peninsula Park-View, and you can, too. As the name suggests, this resort is located across from one of entrances to Wisconsin’s Peninsula State Park, and so is in a great location. You can choose a sprawling suite, a room with a private entry or a roomy cottage. Our favorite was the Anniversary Suite, which is actually housed in a 1939 vintage Ephraim cottage. The owners actually moved the building from Ephraim and refurbished it while preserving its vintage character such as a bay window, original stone fireplace and built-in corner cabinets in the dining area. This suite has a fully equipped kitchen, private bath and whirlpool tub and newer wood floors. “People love this. It’s rented practically every weekend,” says Carole Vande Walle, owner of A Peninsula Park-View Resort. 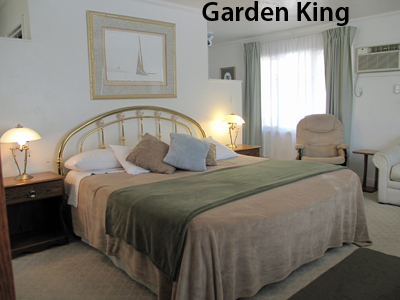 Another choice is the Garden King room. Here, the décor is more towards the contemporary side. The bright space is outfitted with a king-size brass bed, gas fireplace and sofa sleeper. There’s a fully equipped kitchen and private bath, too. People can also choose from one of 11 standard rooms with private entry. When Carole and her husband, Ron, purchased A Peninsula Park-View Resort in 1999, these were the original rooms here. In addition to moving the Ephraim cottage over, the Vande Walles made a number of upgrades to the original rooms and enhanced amenities. The owners are constantly making upgrades to the property, which we like! Now, all accommodates include a microwave, refrigerator, television and VCR. “People always ask, ‘Why do your rooms smell so good?’ It is the fresh air. We get cross ventilation,” Carole says. The Vande Walles also expanded A Peninsula Park View by acquiring cottages from their neighbor. 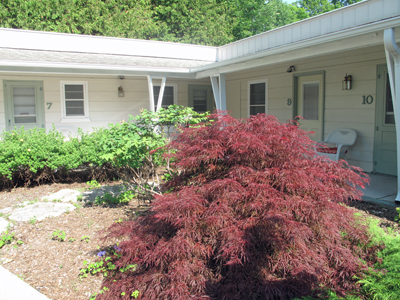 Guests can choose to stay in a two-bedroom cottage (outfitted with a double and queen size beds) and with one bath. It has a large living room and dining area. The cottage connects to a three bedroom cottage (outfitted with a queen-size, double and two twin beds). Families traveling together for a family reunion may enjoy this rental. It offers a lot of flexability. Another cottage, toward the rear of the property, offers up two bedrooms (one with a queen-size and another with two twins). It has a nice view of the quiet backyard. The resort is also home to Peninsula Photo Imaging. Eventually, the Game Lodge on the property may be used for classes. Also available to guests is a large heated outdoor pool and complimentary bike rental. How about coffee and a Kringle? Well, Ron serves up Racine-made Kringle and coffee every morning, and lights a fire on cool morning too, in the gathering room. “There is never any waste,” Carole says of the Kringle. As we have said, the owners are working on improving the property all the time, making it better and better. While they have lots of tips for guests, their best advice is to see Peninsula State Park, the second oldest park in Wisconsin. This 3,776-acre park features an 18-hole championship golf course, bicycle trails, ski and snowmobile trails, beaches and campsites. Don't forget your camera - this is one gorgeous park! “We are right across from the park,” Carole says. “A lot of people stay here because of the park and our bikes - we have 21 speed comfort bikes. And people also say they stay here because we are nice! They are indeed! Carole is nice! And those are all great reasons to stay at A Peninsula Park View. And they have limited winter hours too! Visit their website right now, and when you make you reservation, please tell them DoorCountyNavigator.com sent you - that helps keep this site alive & well for you! Thanks for your help!